Providing you the best range of agitated thin film dryers with effective & timely delivery. We are leading manufacturer, Importers and Service Provider of Agitated Thin Film Dryer ATFD and our product is made up of good quality.The outlet of ATFD will be in the Powder form having 10-15% moisture. This system will evaporate the solution by a thin layer formed on the Surface. ATFD is standing for evaporation of water/solvents to make a concentrated liquid to dry powder or flakes. Based on application either recover solvent or dry product in important.ATFD is the ideal apparatus for continuous processing of concentrated material to dry solids. 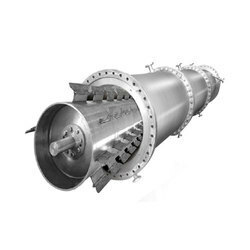 ATFD is consist of cylindrical, vertical body with heating jacket and a rotor inside of the shell which is equipped with rows and pendulum blades all over the length of the dryer. The hinged blades spread the wet feed product in a thin film over the heated wall.The turbulence increase as the product passes through the clearance before entering calming zone situated behind the blades as the heat will transfer from jacket to main shell the under the smooth agitation water/solvent will evaporate and liquid will convert to the slurry, to cake or too dry power or flex.The vapors produced rise upward, counter- currently to the liquid and pass through Cyclone separator mounted of vapor outlet of ATFD. Pharma Industry: Drying of products for API and its intermediates to eliminate the conventional process of drying. Recovery of important solvent from the feed. Textile Industry: Drying of concentrated liquid for salt recovery to eliminate crystallizer and filtration system. Agro Chemicals Dyers and pigments Industry: Drying of products for recovery of an organic product, to eliminate other conventional systems. Chemical and Petro Chemical Industry: Drying of chemical and petro chemical products to recover the powder of cakes. Sugar Industry and Distilleries: Drying of concentrated effluent to make zero liquid Discharge System. Treatment Plants: One stop solution for drying of effluent to make zero liquid discharge.